Montana hits us wit a brand new joint not on the Album.With Assistance from Mavado it def gives this record the extra wave. 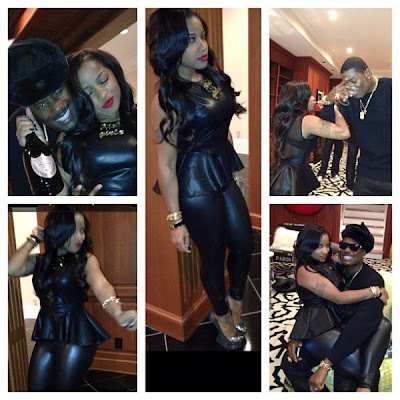 Toya and Memphitz have been filming for their very own reality show titled "Crazy In Love". The show will be about how the two go about their daily lives, how Toya manages her busy schedule along with being a mother and a wife, and we get to learn that Memphitz has had a vasectomy in the past and is looking to get that procedure reversed so that he can have a baby with his wife, Toya. Meet Kevin Hart "The Black Hightlighter"
When I Stumbled on this info I Said This Is Gotta Be Some Sick Twisted Joke !! Singer Chris Brown paid Ariel Castro's bail today, saying the Cleveland kidnapper is a "misunderstood figure" who is being unfairly treated by the criminal justice system. Whoa !! Foxy Brown Exposes Jay-Z (Claims He Molested Her At 15 & Homosexual Relationships)?!! Tanasia Paynter, pictured left with her mom Kitina Simmons. (UPDATE) Kriss Kross Member Chris "Mac Daddy" Kelly Found Dead ! Possible Drug Overdose!! #Health : 75 Yr Old Bermuda's Best "BellMan" Stays In Shape By Doing 300 PushUps A Day! Hotel veteran Winfield Todd, 75, winner of the Visitor Industry Partnership (VIP) award in the doorman/bellman category. his year’s winner of the Visitor Industry Partnership (VIP) award for best bellman/doorman can definitely be called a veteran of the industry as he started off working in a hotel at nine years old.